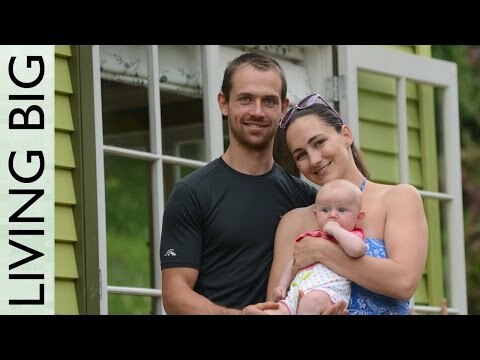 Simple How to Build a Tiny Home using our Tiny House Plans! If you think our tiny house is beautiful too and you would like one just like her – these framing plans will show you how it's done with our easy to follow How to Build a Tiny House plans. What Are You Getting When You Buy Our How to Build a Tiny House Plans? If you purchase these tiny house framing plans we'll show you both 2D and 3D pictures for the framing of the entire tiny trailer house. That includes the sub floor, bottom floor, top floor, loft and roof. Also included is the Google Sketch-up file for these plans so that you can play around and make any modifications you might want to make. The plans are provided in both metric and imperial units. These tiny trailer house plans are based on the trailer we used for lucy. The trailer measures 7.2m by 2.4m (23'7.5″ by 7'10.5″) giving a floor area of 17.3m2 (186 sqft) and is rated to carry 3.5 tonnes. The total height of the timber framing is 3743mm (12'3″). It was designed for the additional height of the trailer and roof cladding to be below 4.25m (13'11”) the legal limit in New Zealand. As far as we are aware, this would make it legal in most other countries. 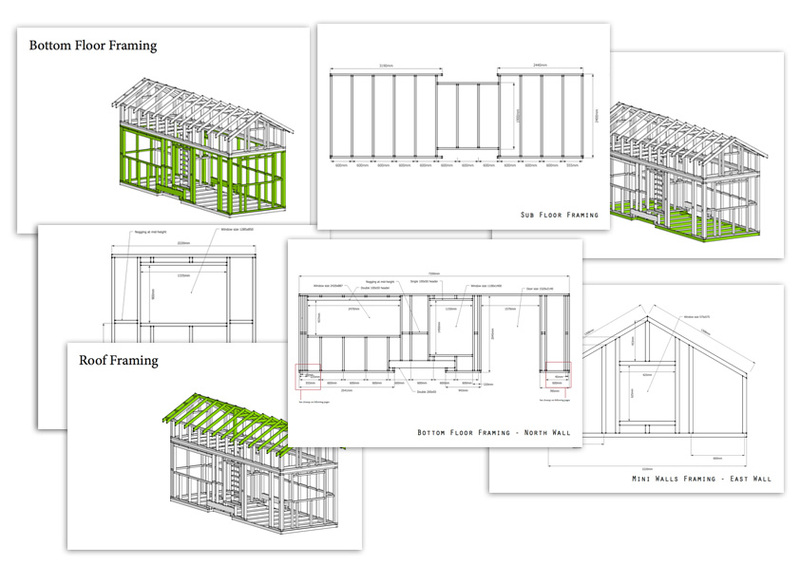 Framing plans come as a 44 page pdf file which requires adobe acrobat or similar to view. Also available for download is copy of the 3d model as an skp file. You will need the free google sketch-up to use this file. After purchasing you will be taken to a page with the framing plans and the sketch-up model which you can download immediately. We've comfortably had 8 adults seated in our tiny house. The corner couch is built to seat 6, the armchair seats one more and the bottom step of the storage stairs doubles as an extra seat for the 8th person. Friends always comment on how cozy and comfortable the space is – visitors often say they don't want to leave! Shayne runs an online recovery program for women who have bulimia. Most of the work is computer based and with our little baby Hazel to look after it makes sense to work from home. We've set up a dedicated office space so that Shaye can easily juggle being a mom and helping the women in her program. And check out our convenient ‘Mason Jar Sized' Storage Designed Into The Internal Stud Wall. This is actually part of the framing and so you'll see it included in Lucys internal framing plans. Stretch Out in The Shower – It's Full Size! … And there's plenty of space for whatever style toilet you choose – flushing or composting. We also built in some storage for bathroom essentials and a washing basket. We love sleeping up in the loft. It's spacious enough to comfortably sit up (Tom is 6 foot and there is space to spare) but at the same time it's super cozy. Our beautiful little girl Hazel sleeps in her Moses basket beside us. And if you're wondering if there's space to do ‘other' things in the loft… Of course – how do you think Hazel was made? Okay TMI, sorry!! Shaye was convinced she would accidentally kill herself if we accessed the loft via a ladder… so for her, it was a total No-No. We decided to use storage stairs instead and think it's one of the most awesome features of our house. We also decided to utilize the lounge area by adding a corner couch containing 6 large drawers beneath. Our ottoman also opens up for yet more storage! We also have an additional ‘Mini-Loft' Perfect for those ‘extra' things that you don't use as often. (Like the pre-pregnancy clothes that Shaye says she will fit again one day 😉 The mini storage loft is part of the framing and so you'll see it included in Lucys loft framing plans. When people walk into our tiny house one of the first thing they say (after “I could live here!”) is “It's so light and airy!”. This is thanks to the beautiful french door and large windows – something that is quite uncommon in other tiny houses we've seen. We've added a little porch outside our French door which makes for a nice indoor/outdoor flow. 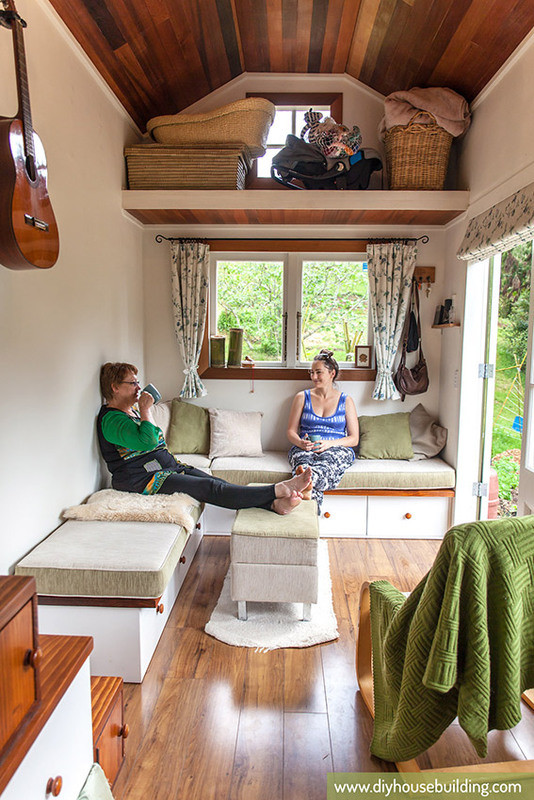 High Ceilings Make The Tiny House Feel Grand! “There are two ways to be rich: One is by acquiring much, and the other is by desiring little.” – That's what tiny house living is all about… Being happy and satisfied with the simple blessings in life. Getting rid of all the ‘fluff' in your life to allow you to focus on your simple blessings and enjoy them every day. By requiring less, you require less money. This enables you to spend fewer hours working and more time doing what you love most. Or, as in our case – it enables us to work in jobs we love (Shaye as a bulimia recovery mentor and Tom is currently learning to be a natural builder) – we don't earn as much as we would if we got work in our trained fields – but that's okay… We have more than enough, thanks to the way we live – part of which is Tiny House Living.